You wander into a newly opened "Bistro and Wine Bar" in a favorite neighborhood only to find it is actually just a restaurant -- sometimes even lacking the very piece of furniture that "bar" generally refers to -- that serves wine by the (often over-full and impossible to swirl) glass? 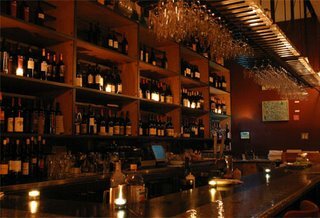 Real wine bars have actual, um, bars, along with wine by the taste and an extensive list that changes, according to Alder. Ideally, they have knowledgeable servers and nice stemware. Sounds reasonable. Fake wine bars meanwhile, tend to be restaurants with the words "and Wine Bar" tacked on to the end of their name. Or wine shops with a tasting area.